We are well into the Carnival season over here and we are approaching one of the popular Greek food feasts: Tsiknopempti. It’s BBQ Thursday or smoke Thursday, I will be ‘smoking’ the house and in case you feel the urge too, there is kontosouvli further down. Head straight to the recipe. But, what is Tsiknopempti? In line with Greek Orthodox Church traditions, carnival marks a three week period prior to Easter when believers start preparing for lent. The transition from full fat diet to lent is made in small steps, cutting down on something every week. Tsiknopempti marks the Thursday of the second week, 11 days before lent starts. Observant church members can indulge in their meat eating habits and fire up that BBQ, it’s all about grilled sausages, lamb chops and generous quantities of meat. The week that follows, known as tirini, consumption of all dairy products is allowed. At the end of this week, carnival celebrations are in full swing, with parades, masquerades and street parties throughout Greece, much in the Dionysian manner. It all culminates with Clean Monday, a bank holiday, when sea food comes in the spotlight, it’s pic-nic and kite flying day. And then you go vegan. But do we? I know for certain that Grand-ma Nia does, she has never broken lent. Many of the older generation follow strict diets during lent, but this is not the norm. Modern eating habits have become much more liberal, dictated more by everyday needs and whims than religious practice. However, many find lent as a very apt way to streamline it with this detox diet that is waiting on the shelf and loose some weight before the even bigger Easter feast. In case you do find yourselves around for the day, make sure you book a table for the grill house or take advantage to visit a seafood restaurant instead. Taverns and grill houses are packed to the brim. As for me, I tend to avoid the crowds and even if the balcony doesn’t allow for a BBQ – it’s a tad narrow- I ‘smoke’ the pans with a few lamb chops or have a roast. The one I really love for Tsiknopempti is kontosouvli, it is a pork roast similar to oversized souvlaki. Traditionally kontosouvli is made on the spit, slowly roasted over wood fire. Of course, there is no reason to dispear if you have no BBQ handy, kontosouvli is great in the oven too. Perfectly accompanied with golden roast potatoes. First prepare the marinade, in a large bowl add the pork with the tomato juice, olive oil, one roughly cut onion, crushed garlic cloves, oregano, mustard and paprika. Cover and leave in the fridge overnight or for at least 1 hour. cut 1 onion and the pepper in rough chunks. You will need to pass the pieces of meat in your skewer, alternating with the onion and pepper pieces. Peel the potatoes and cut them in chunky pieces for roasting. 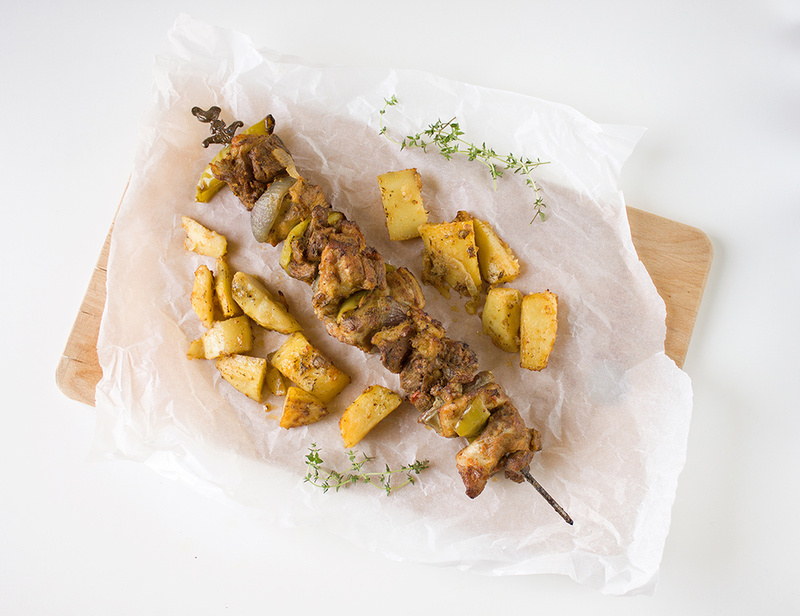 If using one large pan, transfer the potatoes in the baking tray and rest the kontosouvli skewer in the middle. Season the potatoes with salt, pepper and oregano, a bit of olive oil and the rest of your marinade. Cover with foil and bake in a preheated oven for 1 hr 15 min at 180 °C. Serve with ample quantities of red wine. Thanks Ekaterina! will you be making anything special for Tsiknopempti? I love the way you translated lent into modern terms==detox. The meat looks very tasty!